Between 1696 and 1698 the world's first offshore rock lighthouse was built on the Eddystone Reef, a long way out to sea southwest of Plymouth. This lighthouse, and the three that followed, were all considered to be among the greatest engineering achievements of their age. The Eddystone Lighthouse quickly became a symbol of Britain's maritime, trading and industril power. 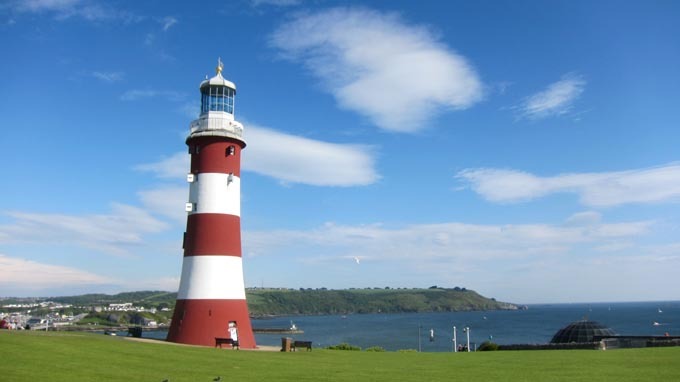 When Smeaton's Tower was replaced, after 123 years guarding the Eddystone, it was largely rebuilt on Plymouth Hoe." (2) 第２代目の灯台→　Rudyerd's Light: 1708 - 1755, Built mostly from wood, Rudyerd's Light was destroyed by fire in December 1755. (3) 第３代目の灯台(画像に見る灯台で、ホーの丘に一され現在にいたる)→　Smeaton's Tower: 1759 - 1882. 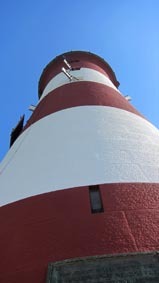 John Smeaton designed the third Lighthouse. It was built of stone and fireproof. Shaped like an oak tree and using a newly invented 'mix' of waterproof cement, it became the pattern for future lighthouses. Granite was used for the external walls, with carefully shaped and jointed limestone on the inside.